1/4 (6mm) x 230 feet of Double Braid Dyneema Line. Uses: Halyards, Sheets, Guys, Reef Line, Low-Stretch Control Lines, Winch Line. Color: White with Blue Fleck. This line has a polyester jacket braided over a 12-strand 100% Dyneema Core. Other sizes and colors may be available--please contact. Box 1368, 1898 Railroad St. 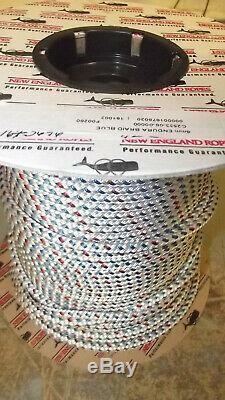 The item "1/4 (6mm) x 230' Halyard Line, Dyneema Double Braid Line, Boat Rope - NEW" is in sale since Friday, March 15, 2019. This item is in the category "eBay Motors\Parts & Accessories\Boat Parts\Marine Rope". The seller is "castobargains" and is located in Statham, Georgia. This item can be shipped worldwide.